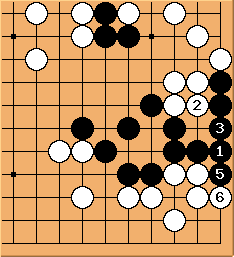 By playing , White creates a 4 point (miai counting) threat of a snapback with . 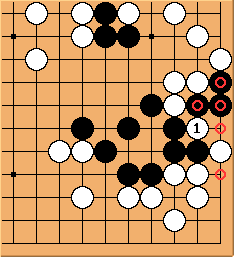 is the correct local move, saving Black's two stones and threatening . Later and are worth 1 point miai. 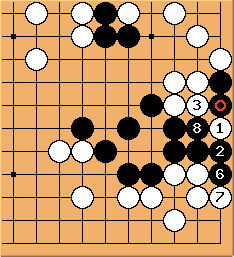 Black is 1 point better off than in the first diagram. - gains 1.5 points in gote. Later , , , and are 1 point moves. This is the price of Black's tenuki and it is not large. Carcer- just a thought isn't the snapback 0 points? white gets two points and black also takes 2 points? Bill: The snapback is worth 4 points. If White captures the 3 Black stones she gets 8 points in gote (the 3 stones plus the 3 points they occupy, plus the 2 points), while if Black saves them those points are not territory. Before the snapback White can claim 4 of those points. If she plays at she gets 4 more points, while if Black plays there he takes 4 points away.